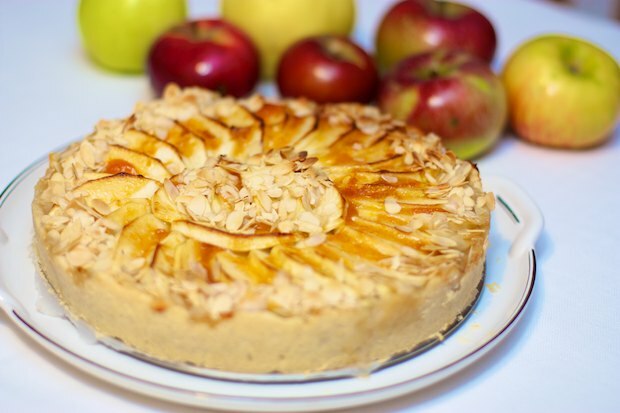 British food does not enjoy great fame in the culinary traditions of our country, however, many years ago I discovered an apple dessert that has remained among my favorites. Every now and then I use it (when my husband and I are alone at home) as a substitute for dinner. This recipe is very useful when you want to make something aesthetically pleasing, but not very sweet or caloric. First you should prepare the apple sauce. Peel the apples (leaving two apples aside for decoration), cut into small pieces, and put them in a saucepan with the juice of half a lemon. Turn on the heat and cook, stirring frequently, for about 30 minutes, until the apples form a custard. The custard should be dry. If it seems too watery, continue cooking for a few minutes and add a tablespoon of flour, mixing thoroughly. While apples are cooking, prepare the dough for the base of the cake. Add the flour, the butter, two tablespoons of water, and a bit of salt in a bowl. Mix quickly with your hands until it forms a ball. Wrap the dough in plastic wrap and leave in refrigerator for 30 minutes. Peel the rest of the apples and cut them into very thin slices then pour the remaining lemon juice over the apples. Dilute the jam with apricot brandy or water. Remove the dough from the refrigerator, cover the bottom of a spring form pan with parchment paper then line the pan with the dough, creating a container to pour the custard. Pour in the custard. Arrange the apple slices as indicated in the photo. Brush with the diluted jam and ground almonds. Bake for about 45 minutes. The surface should be golden. Serve warm. Posted in Dessert and tagged with Apple Flan, Flan di Mele. RSS 2.0 feed.